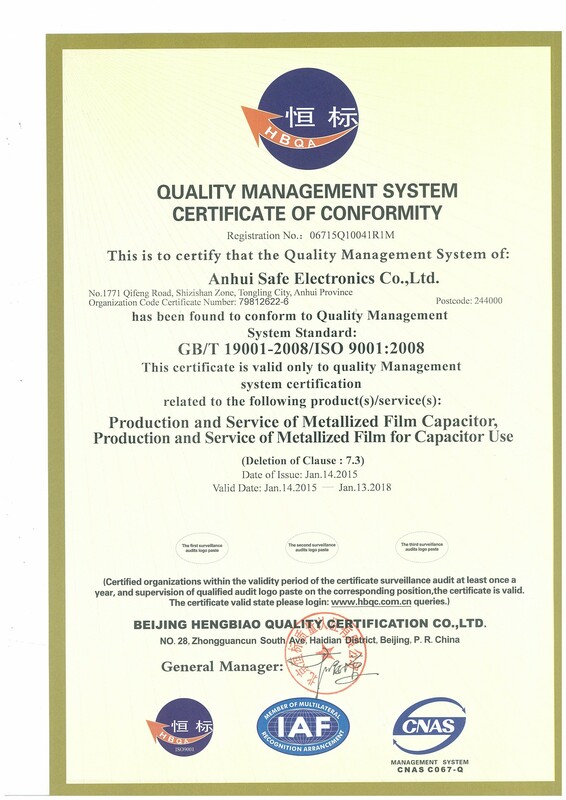 Anhui Safe Electronics Co., LTD. earned ISO9001 certification - Anhui Safe Electronics Co.,LTD. ISO9001 is used to testify that the organization has the ability to provide products that meet customer requirements and applicable regulatory requirements aiming to enhance customer satisfaction. With the continuous expansion of commodity economy and increasing internationalization enhancing product’s reputation, reducing repetitive inspection, weakening and eliminating trade technical barriers , maintaining the rights of producers, distributors, users and customers and the third certification party is not subject to the economic interests of both parties are the passport to quality analyze and supervision of products and enterprises. They are also the basis for customer’s reviewing the quality of suppliers. Enterprises have the ability to meet the technical requirements for ordered products. All certified enterprises has reached the international standard of all management system indicating that they have the ability to provide customers with expected and satisfactory qualified products. For customer’s good enterprises should be customer-centric satisfying customer’s needs, never inducing.